Losing Language , 2008 was my first site-specific sculpture to bring natural material back into the environment from where it came. 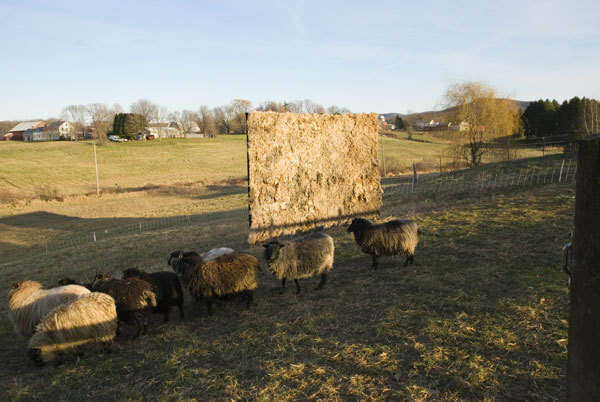 The 11x15 foot wool sculpture is placed back in the pasture of the sheep whose wool was sheared for this project. 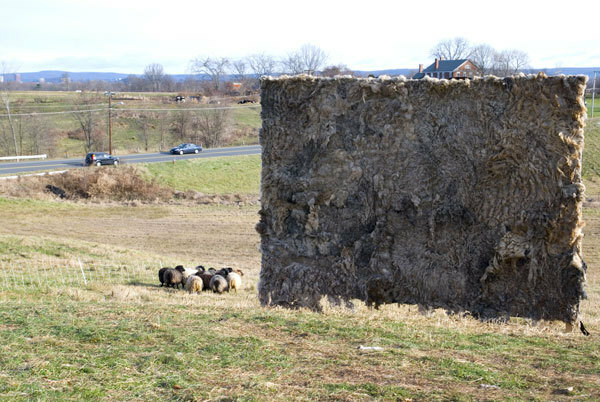 The flattened, stationary, larger than it should be sheep provided contrast and similarities with the grazing, moving round sheep. The wind blowing into the structure billowed the needle felted wool simulating a giant sheep breathing in tandem with it’s wooly flock. 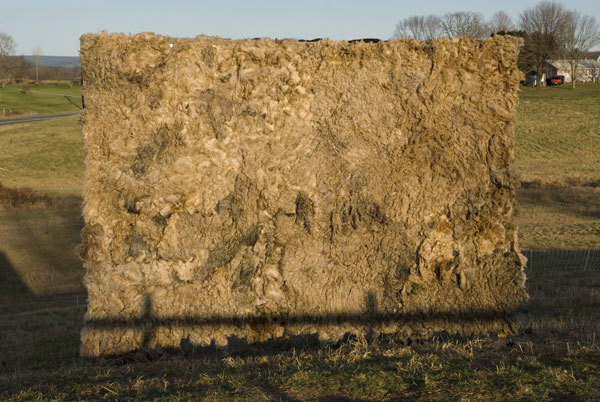 The title Losing Language comes from time spent with the farmer who sheared the wool for this project. She whistled her Border Collie to gather the sheep I had selected and we sat through the spring afternoon warmth while she hand sheared. Soon our conversation slowed, then stopped all together as the sheep wandered around us wooly and friendly. "Well, it's happened", she said. "We've lost language. It happens up here when you are with the animals". 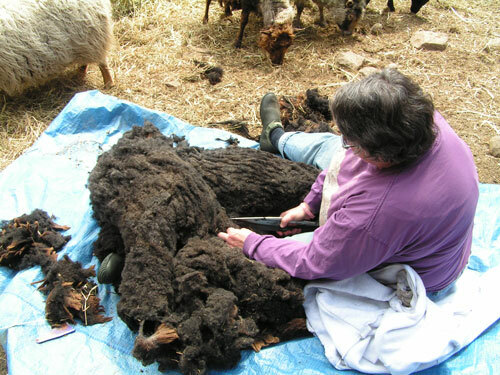 The raw wool was needle felted onto a felt substrate by using a barbed needle to push the wool through. 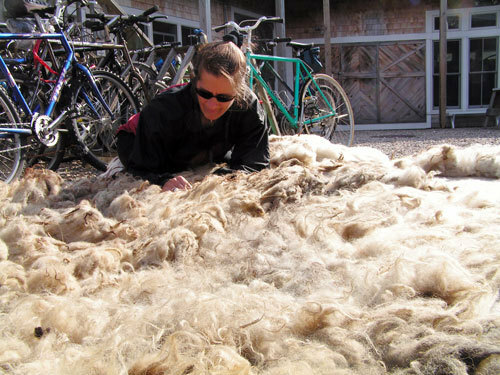 There are approximately 7 fleece on this sculpture. I like to leave my work outside after the installation has come down to see what the weather will do to the wool. It has been attacked by a bear and dragged across my lawn, survived a hurricane and two winters of heavy snowfall. Moss is starting to grow and in the summer the piece has a green glow, part animal, part plant. 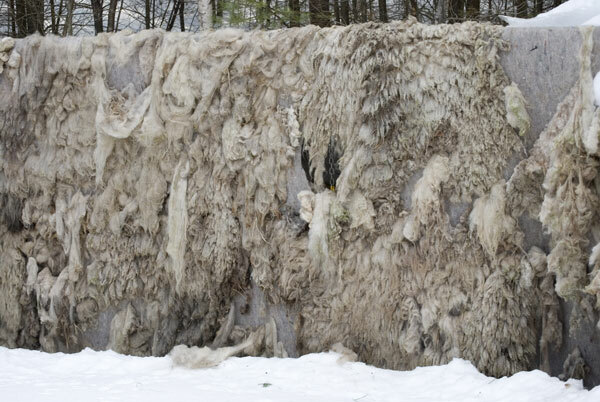 The resulting action of wool sloughing off the substrate reminds me bison shedding their outer coat.